Leading off from the Grand Place square, a little distance away past crowded streets in a corner is the statue called Manneken Pis. This is a bronze statue of a small naked boy peeing. It is a fountain, with water replacing the pee! This is the most famous statue of Belgium. However, tourists expect it to be big, but it is actually a very small statue placed in a corner of narrow streets. The Manneken-Pis is at the corner of the Rue de l’Etuve and the Rue du Chene. The Rue Charles Buls leading from the Square becomes the Rue de l’Etuve. The statue is dressed up in colorful costumes on different occasions according to a weekly schedule. The Manneken-Pis has several hundred costumes. The changing of costumes is accompanied by live music. “in 1619, I was 5 years old. I got lost in Brussels. After 2 days of frantic searching, my father, a nobleman, found me in an embarrassing position…peeing. As a token of gratitude, he ordered a fountain to be build, with a statue depicting me in that same position.” The picture of this poster is given on the right (click to enlarge). 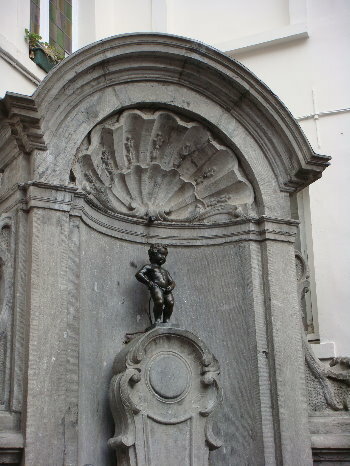 The Manneken Pis has a female counterpart called the Jeanneke Pis. This is a modern piece of sculpture made of limestone, by Denis-Adrien Debouvrie, in 1985 and erected in 1987. This is located on the other of the Grand Place away from Manneken Pis. It is in the east side of Impasse de la Fidélité (Faith Alley) which is a narrow dead end street leading off from Rue des Bouchers (Butchers’ Street). After reaching Grand place take the Rue Charles Buls which becomes the Rue de l’Etuve. The Statue is at the corner of Rue de l’Etuve and Rue du Chene. The details of getting around Brussels is given here. In the picture below, the left hand street is Rue de l’Etuve and the street on the right is Rue du Chene.